Peter Cannon is not a character that I am very familiar with, I mainly know him by the fact that he was the inspiration for the character of Ozymandias that Alan Moore created and used in his brilliant maxiseries WATCHMEN. Well it turns out that that’s all you really need to know in order to follow this latest series from Dynamite Entertainment. This gist of it is that Peter was orphaned at a young age and taken in and raised by a secret advanced civilization in the Himalayas, who raised him with all of their mystical and scientific knowledge which enabled him to access hidden areas of his brain which now make him the smartest man in the world . 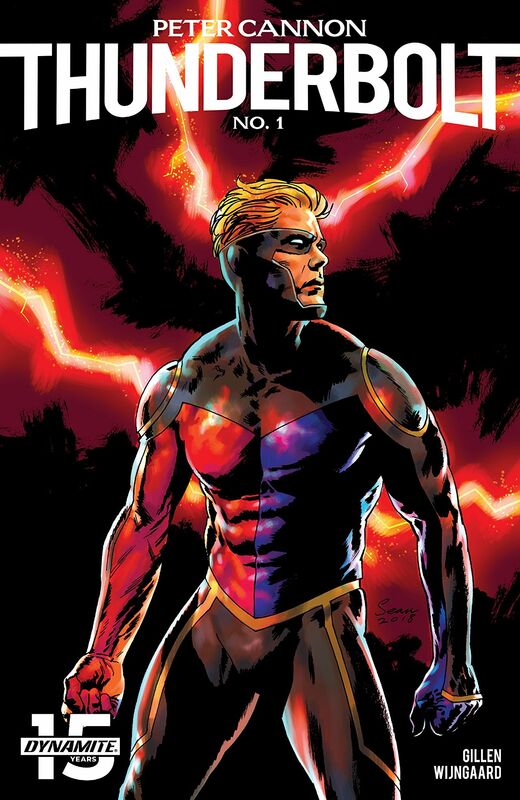 Now living in America with his faithful assistant Tabu, he has amassed a fortune and uses it, and his intelligence, for the betterment of mankind, occasionally donning a costume to act as the superhero called Thunderbolt (although his identity is publicly known). As this issue begins, Peter is being confronted by a group of superheroes from America, Russia, and China, the major world superpowers who were recently on the brink of world war, until the world was attacked by an apparent alien invasion. With Peter’s help, the superheroes team up and defeat the aliens and thus the world is saved. In the aftermath of their victory, the various heroes inform Peter that the leaders of their home nations are now eager to set aside their previous conflicts in favor or a worldwide alliance to guard against future such invasions. Sound familiar? Wow. I must say that I love the way writer Kieron Gillen utilizes the main plot from Watchmen here, taking that infamous ending and using that as this series’ starting point. Sure, it could seem a bit gimmicky, but I’m willing to reserve judgment until I see where he goes with this. It’s also impressive how he drops us right into the middle of this new world in a way that suggests a long history behind it, including introducing a bunch of new superheroes with allusions to many past adventures, both together and apart, but still managing to make it all feel accessible to us new readers. Peter Cannon is written in a way very similar to Mark Millar’s Edison Crane from Prodigy, in that his hyper-intelligence often leads him to boredom with mundane affairs, and it appears that he involves himself in super-heroics precisely to relieve that boredom. Gillen is ably backed by artist Caspar Wijngaard, who proves to be just as adept at drawing static “dramatic” scenes as he is drawing the dynamic action sequences, such as when the heroes are fighting the aliens. I enjoyed this first issue and am excited to see where these Gillen and Wijngaard go from here. I remember back in the 90s reading a DC comic and there was a ad for this character. I thought he was a DC character and the way I remember the comic advertisement it was like he was making a comeback of some sort. I didn’t know his history or powers until you posted this. Yes, DC has published a version of this character before. What happened is that he was one of many superheroes published by Charlton Comics back in the 60’s before it eventually went out of business. Eventually DC bought the rights to Charlton’s characters, which included others like Blue Beetle, The Question, and Captain Atom. Peter Cannon was also one of them but apparently, I don’t know the exact details, Charlton didn’t outright own Peter Cannon, they had a licensing deal with his creators. So when DC bought Charlton’s catalog, while they got full outright ownership of the other heroes, they only got the existing licensing deal that Charlton had for Peter Cannon. So DC used the other characters a lot more, including having some join various versions of the Justice League in addition to getting their own ongoing series’, but didn’t make the same effort with Peter Cannon. He did eventually get a series, which is what you’re recalling, but it only lasted 12 issues, and so DC just eventually let the license lapse as I guess they didn’t see any real demand from fans for the character, and it went back to the original creator (or his estate, I don’t know if he was or is still alive). Some time ago Dynamite either aquired the license or maybe they did outright buy the rights to the character, and they started publishing new comics. This is actually the 2nd new series they’ve done about Peter Cannon (but I never read the first one).